Shivering is the opposite of glaze crazing, the fired glaze is under compression and wants to flake off the body, especially at edges. However the route cause is a mismatch in the thermal expansions of body and glaze, thus the process of resolving it is similar as for crazing. It it much less common because glazes tend to have a higher thermal expansion than bodies and because they can tolerate being under compression much better than being under tension. 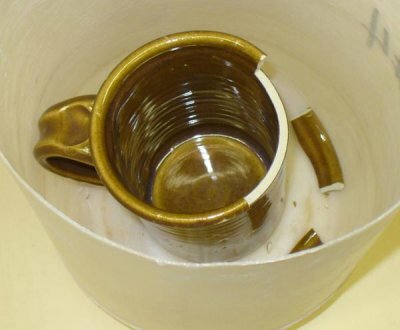 Of course, if a glaze is under compression on the inside of a vessel, the body will be under tension and this can cause failure of the piece. When the body-glaze interface is not well developed an overly compressed glaze will be able to release itself much more easily, especially on the edges of contours. This can be the case, not only with low fired ware, but where engobes or slips are being used under the glaze. If the engobe does not contain enough flux to firmly adhere it to the body and develop hardness, it will not be able to bond to the glaze well. It is important to recognize that the appearance of this issue is serious, a few shivered pieces coming out of the kiln could mean that all of them will shiver with time! Shivering is also serious in that razor sharp flakes of glaze could get into food or drink, you must make sure this can never happen. While many band-aid fixes to the issue are recommended, the base problem is a mismatch between the co-efficient of thermal expansion (COE) of body and glaze, nothing will properly fix it except raising the COE of the glaze (or lowering the body COE). Many many glazes have high expansion Na2O and K2O that are more than they need to be (thus the prevalence of crazing), but here we actually need more of them (so this is an easy fix to do). However in fast-fire settings, Na2O can cause bubbling (fast fire glazes have lower B2O3, higher ZnO and CaO, lower Na2O and higher SiO2, you must work within these guidelines). But you cannot just add soda feldspar or a high soda frit because they also contain other oxides. Using ceramic chemistry software (like Digitalfire Insight), you can figure out how to adjust the recipe so that the only change in the chemistry is an increase in the Na2O/K2O. In the case of adding feldspar you would calculate how much to reduce the kaolin and silica in the recipe to compensate for the Al2O3 and SiO2 also sourced from the feldspar. There are instructional videos at Digitalfire.com that demonstrate this. It may also be an idea of check your clay body. Has it changed? For example, if it is less mature its expansion could have increased and the glaze:body bond could have been degraded. Example of serious glaze shivering using G1215U low expansion glaze on a high silica body at cone 6. 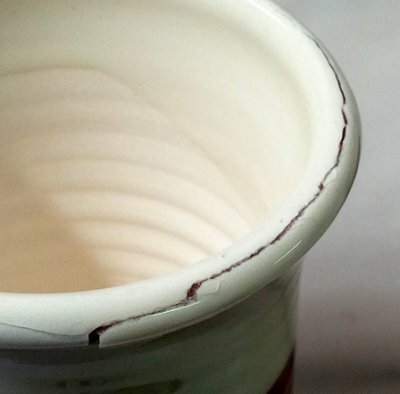 Be careful to do a thermal stress test before using a transparent glaze on functional ware. These mugs have experienced very serious shivering. This is an Albany Slip glaze with 10% lithium carbonate, it is known to have a very low thermal expansion. This problem can be solved by reducing the amount of lithium or adding high-expansion sodium or potassium. However these fixes will likely affect the appearance. This mug is pinging loudly and literally self-destructing in front of my eyes! Why? The glaze is under so much compression (the inside is pushing outward, the outside inward). Spiral cracks are developing all the way up the side. Small razor-sharp flakes are shivering off convex contours. Why? 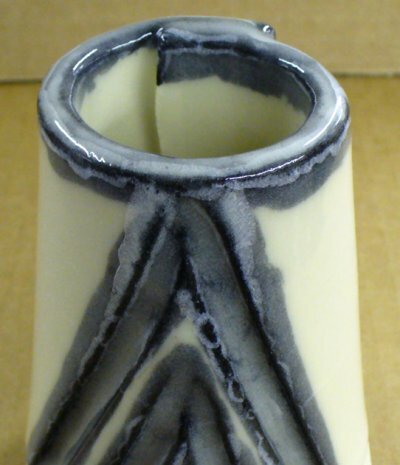 I accidentally fired a low-temperate talc body at cone 6 (the glaze is the Alberta Slip base cone 6 glossy). 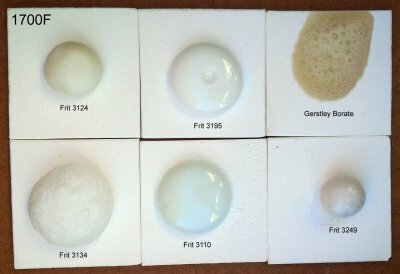 The clay body is not overly mature, but it just has an extremely high thermal expansion (talc is added to increase the expansion to fit low fire commercial glazes, they would craze without it). Shivering is serious, it is a mismatch of thermal expansion between body and glaze. It can happen at any temperature. 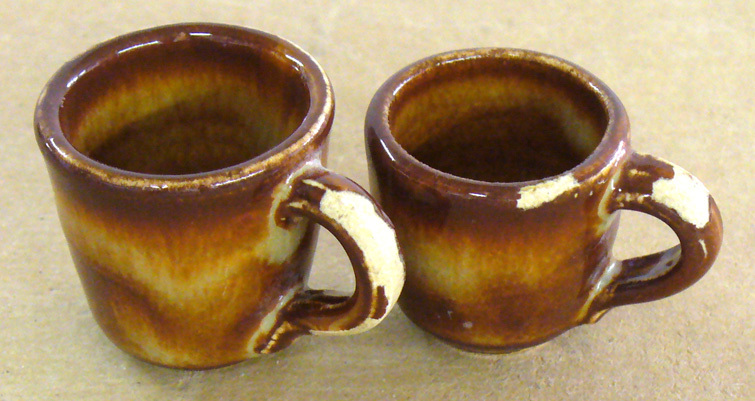 Example of a glaze (G1916J) shivering on the rim of a mug. But the situation is not as it might appear. This is a low quartz cone 03 vitreous red body having a lower-than-typical thermal expansion. The white slip (or engobe) has a moderate amount of quartz and is thus put under some compression by the body. But the compression is not enough to shiver off (e.g. at the rim) when by itself. However the covering glaze has an even lower expansion exerting added compression on the slip. This causes a failure at the slip-body interface. On the inside you can see the razor sharp flakes of glaze that have already fallen off the outside of this test piece. 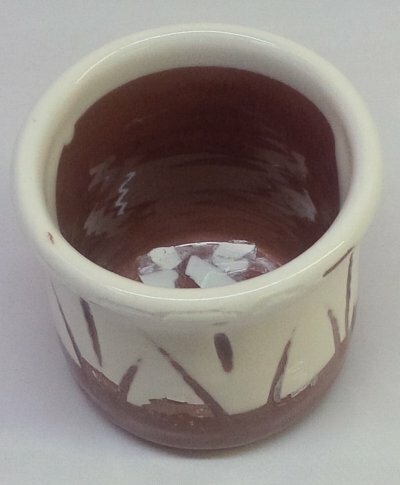 They reveal that the clear glaze, which looks fine on the inside, is under too much compression. The weaker interface between the slip under layer and the body provides a point of failure. This reminds us of the morality of making pottery, we have a responsibility to make safe ware. This demonstrates the difficulty you can encounter when trying to get an engobe working with a clay body. Here the slip/glaze is flaking off the rim of pieces at cone 04 (does not happen at 06). The front bi-clay bar demonstrates the white and red clays dry well together (the slight curve happened on the drying). They also fire well together (the curvature did not change on firing). The back two thin bars seem to demonstrate thermal expansion compatibility: a thick layer of glaze is not under enough compression to curve either bar during firing. 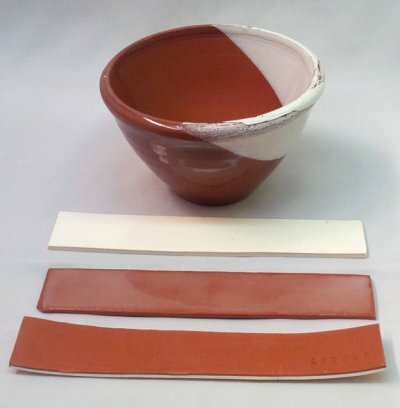 While the white clay contains 15% frit and forms a good bond with the red body, that bond is not nearly as good as the one between the glaze and the white slip. Yet it is still flaking off the rim at the slip/body interface. Why? At first it seemed that failure was happening at quartz inversion (because the body had less quartz than the white slip). However now it appears that the combination of compressions of the slip and glaze are sufficient to break the slip-body bond on convex contours. The compression of the slip and glaze likely did not demonstrate well on the bars because at this low a temperature they are not vitreous enough to be easily curled.